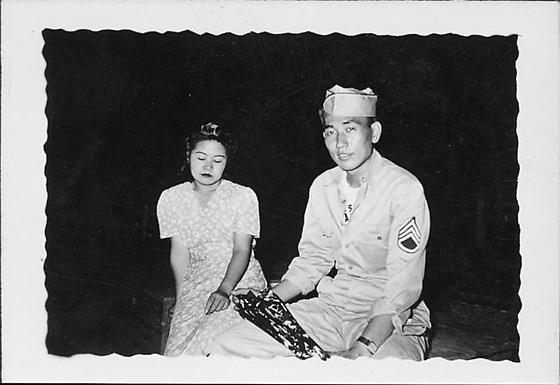 Portrait of a couple, the woman in floral dress sits next to man in a United States Army uniform at Rohwer, Arkansas, 1942-1945. The woman's eyes are closed as she leans against her proper right arm. Dressed in light colored uniform unbuttoned at neck with Staff Sergeant stripes on proper left sleeve and garrison cap, the soldier looks directly at the viewer as he holds a dark cloth with white pattern across his lap. Black background.